I like to consider myself an accidental rail enthusiast. I had absolutely no interest in trains until I became dependant on them for my local and long distance travel. I'm now reasonably well versed in fares and routeing, but no longer dependant on the train. Originally from Portsmouth, now in Cambridge, but having lived in Bristol, near Milton Keynes and London, I have experienced many train operator's services, with each operator having their own positives and negatives. My typical journeys with FGW were previously Bristol to Cosham and local journeys between Temple Meads, Stapleton Road, Redland and Clifton Down on the Severn Beach Line. This was followed by local West London journeys as far as Hayes & Harlington. At the moment, you'll find me moaning about the Cambridgeshire Busway, awaiting the opening of the new Chesterton Cambridge Science Park station and travelling around the country on (mainly) intercity leisure trips. I am getting around by rail increasingly these days for work, using trains to and from Temple Meads, Bath, Stapleton Road, Weston, Swindon, Gloucester, and London. I live in Bristol, am excited by some of the new railway projects - hence the forum name - frustrated by the pace of change, and disgusted by other decisions, most notably MetroBust. I'm also a bit of an aviation nut, being an occasional hobby pilot. I have learned a great deal from following this forum, some of it useful. I commute from Maidenhead to London most days of the week and have commuted with Thames Trains, First Great Western and now with Great Western Railway. "Retired former rail commuter who retains a lifelong interest in lineside architecture in particular. Ironically my most frequently used station now is Melksham, which is one of the least architecturally interesting places on the network (although the former GWR shed used by the foundry is of merit)"
I'm a born, bred and buttered Bristolian with a keen interest in cities and how people get around them. I am a member of FOSBR (Friends of Suburban Bristol Railways) and the Bristol Civic Society, and have written a number of Wikipedia articles on Bristol subjects. My wife and I run a web development business from home, so most of our travel is for domestic and leisure purposes. My family are all regular users of the Severn Beach line, and we generally travel by rail from our local station at Montpelier whenever it is practical to do so. I'm a cartographer, writer and web person usually working in the areas of transport and travel. I was until recently editor of Waterways World magazine and prior to that edited British Waterways' website; I now work freelance and run a cycling website, cycle.travel, inter alia. I get pretty much everywhere by train and bike - only begging the car off Mrs F in extremis! A bout of chicken pox years ago led me to start working on the New Adlestrop Railway Atlas, a historical map of Britain's railways. Life gets in the way and I haven't had as much chance to update it as I'd like, but there's a new version slowly underway. I also do a lot of work with OpenStreetMap, the free map of the world. 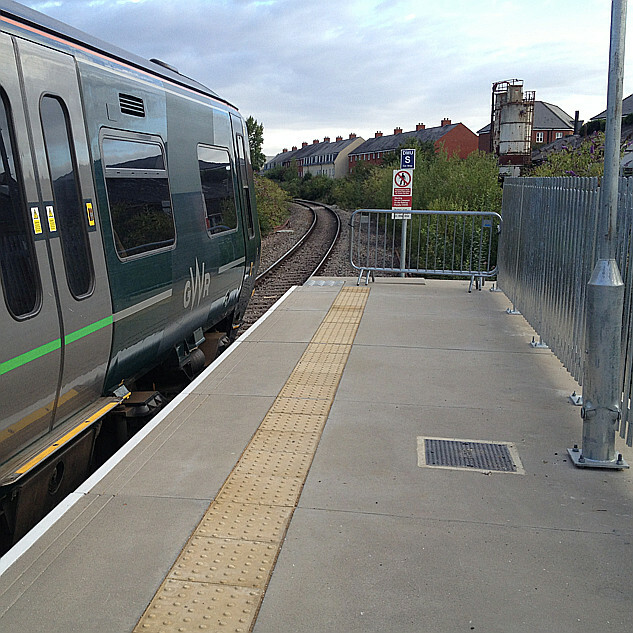 Rail journeys - no common destinations, but a common starting point of Melksham. Purpose - typically business trips to give IT courses, and some leisure trips. Also some many journeys to transport meetings, conferences, and for surveys and other CRP purposes. I used to commute to work by train almost every weekday: Nailsea & Backwell to Bristol Temple Meads return. I also used to travel to my London office occasionally - maybe once a month, HST direct, and to the Manchester office, maybe once every three months - XC. However, due to my employment situation changing, my train travel became rather more varied - I've even travelled on the Severn Beach Line! As a result of my interest in local rail matters, I have also worked part time for the Severnside Community Rail Partnership - helping to develop and improve local station facilities in the Bristol and Somerset areas. I'm really rather fond of my local station at Nailsea, despite the fact that all of the buildings, sidings, signal box and almost all the staff have disappeared over the years - leaving us with just two concrete platforms, a footbridge and four perspex bus shelters. However, things are improving: we're possibly due to get a multi million pounds worth of disabled access ramp! These days, in my present employment as a well-known High Street brand grocery delivery van driver, I use the trains only occasionally - but I remain deeply committed to them, and I can't wait to see the Portishead Branch Line re-opened for passengers! A frequent user of GWR services to the West of England and South Wales, I travel around 30,000 miles a year by train. My particular interests are not just the fact the train gets us from A to B, but the way customers are informed, whether via website, printed leaflet or face to face and also the facilities on board and at stations. I also enjoy making the occasional visit to heritage railways around the country and am keen on the history of the UK railway system. Thanks, Phil. Each of the named people are "Global Moderators" which means that they have the ability to lock topics if necessary, split topics, move topics around, etc ... all of which are things which we don't like to have to do too often. . But much more than that, were around to provide help and assistance, to greet newcomers, to provide occasional "steer"s. If you click on the "notify" button on any post, all of us will be informed of your comments and we can duly act, or you can send a personal message to any individual one of us if you prefer. I also serve as an "administrator" of the forum. That means that I help run the web site as a whole, look after software upgrades, take backups of the database from time to time, and so on. I can be reached by personal message just as the rest of the team can, and I have also made a conscious decision to release my email address (graham@wellho.net) and you'll also find it very easy indeed to find my other contact details such as phone numbers and address should you wish to get in touch that way. Just coming back to add a further link for myself as site owner. My wife and I run an IT training centre and hotel in Wiltshire, and we featured on "Four in a Bed" on Channel 4 on 9th January 2013. The show can be watched for the next 3 weeks via "4 on demand" - http://www.channel4.com/programmes/four-in-a-bed/4od#3463234 - nothing much in the show to do with transport, but it gives a public view if anyone's interested. Further discussion is already here in our frequent posters area, where members who log in and post regularly meet up. "Pinging" this subject to the top as a fair number of the moderator / admin team have updated their information in the last few days. Further update on (my) interests. I was formally proposed for and elected onto the TWSW board at today's Board meeting and the following AGM. I'm deeply flattered and honoured to be asked to join and sit alongside some very knowledgeable people indeed who have the passenger and potential passenger very much upper in their mind. There's a thread introducing TWSW [here], and I'll fill in and say more as I 'learn in'. It's a very busy time for TWSW. The Hendy review out today is to be considered and reacted upon from a passenger viewpoint (not just "big works" lines but also lines effected by potential cascade changes, and by higher than 3% growth) - I noted an 8 week consultation. We then have the CrossCountry Direct award (a very interesting meeting and inputs give to the DfT), the SWT and Crossrail 2 consultations also under way, buses and the "bus bill" and other public road transport changes underway too. Diary dates will pop up for these in the next week or two, and please keep discussing these things as they real help to inform! In one of my occasional roles on the Coffee Shop forum of 'tidying up after grahame', I've simply corrected a couple of his more glaring 'trademark typos' in the previous post ('consultation' for 'consolation', for example) - purely in the interests of clarity, as ever! Thanks, Chris ... it has been a manic day of meetings (four plus informals) and I threw this at the forum before having to dash into the next one. I noticed a new moderator. Was there not an 'introduction' topic? Or has Western Pathfinder been on the team for a while and I just hadn't noticed? I been on the quiet branch line a little while now only light shunting duty so far. I've PMd you with a reply to this morning. I hope the branch line trucks aren't being too troublesome. For anyone reading this post out of context ... posting 29th August 2018, by Graham Ellis ( grahame ) - I'm one of the admins, and provide the hosting and most of the technical stuff. I have been involved with "TransWilts" - and prior to that with "Save the Train" - for a number of years, and I fell accidentally into the role of "Community Rail Officer" for the partnership as it took off ... as the team knew it could, but others didn't quite believe. 4. Ensure that the altered service was / is permanently sustained. The service has indeed been altered, proven, and indeed further improved. Longer platform and trains, growing passenger numbers well beyond targets, and indeed a job done. I tendered my resignation from the TransWilts board and my Community Rail Officer role some three weeks ago - but was [asked/told] to wait until after 28th to tell anyone unless they ask. That’s been to allow the board a chance to let key stakeholders know, and I understand that has now been done. The board have also asked me to carry on to pass over the CRO role to a successor (to be appointed) over coming months. My final anticipated CRO duty will be to write the “Community Rail Officer writes” section for the 2018 annual report. I’m sad to be going but TransWilts has changed out of all recognition since it was founded at the start of this decade. With these changes comes the need for a proper CRO with professional training, with marketing, delegation, administration and organisational skills and who commands the confidence of the chair and board. It's also a great role for someone who actually enjoys the [blossoming/bloomin] admin. I will remain somewhat available to TransWilts in a voluntary capacity though I’ll be progressively busier with other things. I certainly want to watch the service go from strength to strength, and next time Lisa and I take a cruise, to start with a bus to Melksham station, grab a quick coffee there and get a direct train to Southampton. When one door closes, others open. Exciting ones too - but I had best get my ducks in a line before I let the cat out of the bag. And I had better not use too many cliched metaphors in a single paragraph. Looking forward ... followup here via the Coffee Shop ... early next month. Very busy finalising a newsletter and planning some things for the early autumn.